Another positive fact of the online courses is that you can learn either alone or with other people. This is also a good opportunity to practise and learn together with a partner. Also children can take advantage of the online courses; it’s a good example for them to see their parents studying and focused on their tasks. This is definelty one of the biggest advantages of learning online since you can get direct answers from your tutor and you can make questions about anything you like. The autonomous in the learning process is one of the most important facts in the second language learning methodologies, and it is completly achieved throughout the online courses. You will be able to include technical skills on your CV, due to the fact that online courses require e-mail and web browsing skills. Moreover, you will be able to get information in Spanish via the Internet easily. That will open up a world of possibilities not only for your professional career, but also for your personal life. You will be able to find and apply for jobs online, make future travel plans and everything related to it, purchase articles online, get in contact with people from all around the world, get information about your hobbies, etc. At first sight one may think that online courses are only advisable for responsible and dedicated people. However, the key to success is precisely your ability to realize the importance of doing things on your own. Online students are concious about their individual learning process and their accomplishments are much more rewarding. 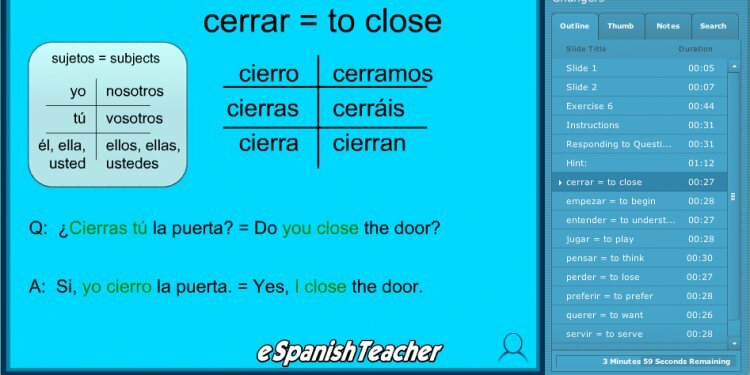 A Spanish online course gives you a real insight of the language and its culture. The cultural awareness is also important when it comes to learn a language and it goes without saying that knowing another culture is essential to get to know the people and the country itself.